Have new Pelicans Mardi Gras uniforms for 2019 been leaked? Several NBA teams have released their 2018-19 “City Edition” uniforms Thursday. 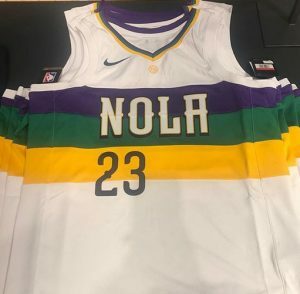 There’s no official word from the Pelicans on this year’s City Edition – which has been their Mardi Gras uniform – but it appears to have been leaked through social media, along with several other teams. The Pelicans’ reported City Edition uniform, as posted on social media earlier this week. If the information is correct, the City Edition for the Pelicans will be a white uniform with bold purple, green and gold horizontal stripes. 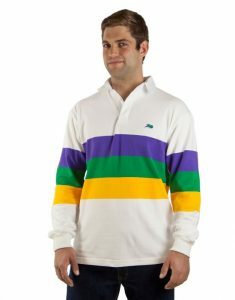 The uniform is reminiscent of the popular Mardi Gras rugby shirts sold by area clothier Perlis. According to the NBA’s uniform database, the Pelicans will wear their City Edition uniforms from Feb. 4 through Mardi Gras with the exception of two nights. One of those exceptions is a Feb. 14 home game against Oklahoma City in which New Orleans will wear its red uniforms – apparently to celebrate Valentine’s Day. The Pelicans are also expected to have a fifth uniform, called “Earned,” based on making the playoffs a year ago. The uniform database, which originally listed “Earned” among the uniform options, has been revised to list only “coming soon” on certain dates. The Perlis Mardi Gras rugby shirts that may be the inspiration for the new Pelicans’ City Edition jerseys. Teams in the “Earned” series playing on Christmas Day are slated to debut their uniforms then. The first date that New Orleans is scheduled to wear the “Earned” uniform is Dec. 29.